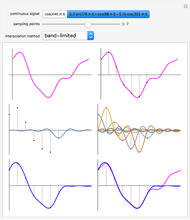 If a continuous signal is sampled with a sampling period then how can you approximately reconstruct the original signal? Three methods that are in use are zero-order hold interpolation, first-order hold interpolation, and band-limited interpolation. 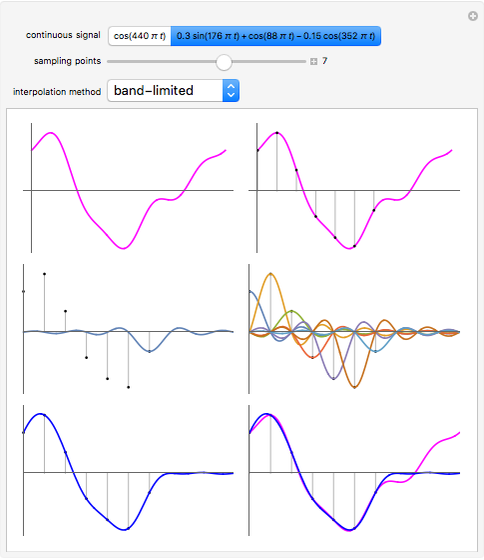 The reconstructed signal is calculated using , where is the value of the sample taken at time and is one of the three interpolation functions. The first plot shows one of two choices for a continuous signal . 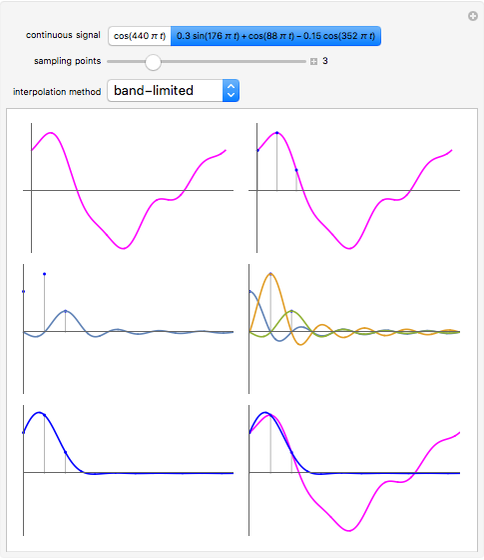 The points on the second plot are the samples for , where is controlled by the slider labeled "sampling points". The third plot shows the sample points along with the last term of the sum. The fourth plot shows all terms of the sum, while the fifth plot adds those terms together. The last plot shows the reconstructed signal in blue together with the original signal in magenta. For zero-order hold interpolation , where is the rectangle (or unit box) function, equal to 1 for and 0 otherwise; for first-order hold interpolation , where is the unit triangle function on the interval ; and for band-limited interpolation , where . 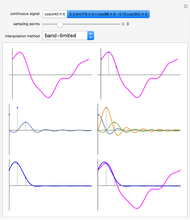 For these examples band-limited (sinc) interpolation gives the best results. This is not a surprise since the sampling theorem says a band-limited signal sampled at a frequency at least twice the highest frequency in the signal can be perfectly reconstructed from its samples using sinc interpolation if the summation is taken from to . For additional information see the lecture on interpolation by Prof. Alan V. Oppenheim at http://ocw.mit.edu/resources/res-6-007-signals-and-systems-spring-2011/video-lectures/lecture-17-interpolation. David Bremner and Bruce Atwood "Reconstructing a Sampled Signal Using Interpolation"